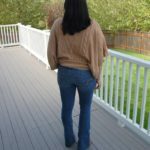 Flattering and comfortable jeans from American Eagle Outfitters! 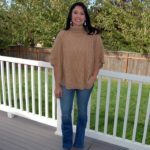 We’ve been spoiled with lovely Fall weather here in the Pacific NW, which is perfect for jeans and a light sweater—exactly my inspiration behind today’s review! I am so excited to show off the American Eagle Artist Jean in Weathered Destroyed, which really is the perfect classic shade of blue denim. 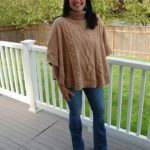 First off—I have to express my deep and devout love for with American Eagle Outfitters ; they are affordable for everyone’s budget, but make well-made clothes that hold up and last forever. 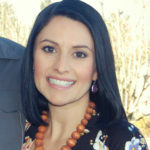 Their styles are cute for a range of ages—from teens to moms like me! 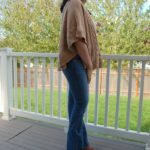 I was extremely excited to get these jeans because I’ve been wearing a lot of skinnies lately (you’ll be seeing some of those reviews soon), and sometimes it’s nice to go back to a wider leg. These jeans are 78% Cotton, 20% Polyester and 2% Elastane, so they have that nice stretch that makes them comfortable all day. My pair has an inseam of 32 inches (regular length), perfect for a shoe with a bit of a heel, and the rise felt like a great medium rise (even though they are described as low rise). The “weathered destroyed” description comes in the form of a ripped knee, and I honestly didn’t notice it much at all while wearing them. Sometimes destroyed jeans can ride that line between being too destroyed, and these were definitely still appropriate for all occasions. 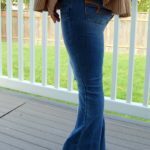 The leg is considered a flare, but I’d call it a flattering flare, not too wide, and in perfect proportion to the slim shape of the rest of the jean. The waist was also very flattering with double buttons, and great deep pockets. 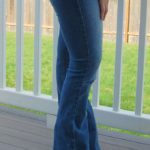 I’m always attracted to lighter colored denim but I like the slimming qualities of dark denim, so this is a really great medium color that is the best of both worlds! The outfit possibilities with the American Eagle Outfitters Artist Jean in Weathered Destroyed are seriously endless, though I would say they will always remain on the casual side of my wardrobe. I’ve been wearing them with sweaters and flannel button-ups, and I love that the flared leg allows for a short boot (and cozy socks!) to stay hidden. Mine are a size 4, and I agree with the reviews that they do run a bit small (I normally take a 2 in American Eagle Outfitters denim). 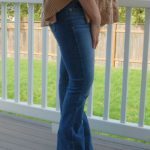 They do have stretch but I think it’s worth sizing up one size, mine haven’t stretched to the point where I could go down a size. For the price these are an absolute steal, I’m already wondering what color to get next!! American Eagle Outfitters Artist Jean in Weathered Destroyed is available here.